In the NVR a trigger is a set of criteria that, when met, starts the execution of a predefined task. In order to get advantage of getting a notification/action defined in a task any task should be assigned to a specific alarm/event. Login/Logout Task — when any user logs in or logs out, the event is raised with information indicating the user and the action (login/logout). Login Task — indicates that a specific user has logged in. Used instead of or along with the general login/logout event, allows different tasks to be assigned individually to users of interest. Logout Task — indicates that a specific user has logged out. Used instead of or along with the general login/logout event, allows different tasks to be assigned individually to users of interest. In the NVR Control Center go to the General — Global Settings. Select an appropriate predefined task from the Login/Logout Task drop-down list. An event can also have a composite task assigned to it. Any composite task consists of several predefined tasks of the user’s choice. 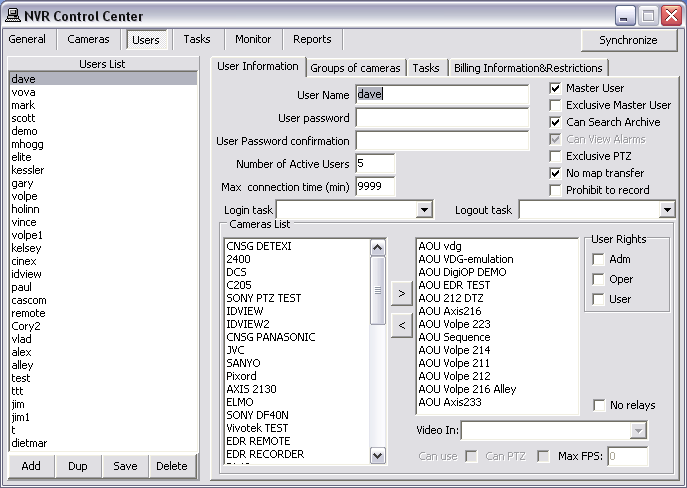 In the NVR Control Center go to the Users. Choose a specific user from the Users List to upload user’s information. In the Users Information select a predefined task from the Login Task drop-down list. Select a predefined task from the Logout Task drop-down list. Click Save button below the Users List to save changes.